Optimal Health in a simple 3 step kit has never been this simple, healthy or easy to use. Whether you are healthy or in any dis-eased state, Imsyser Health Products may help by assisting in treating the root of the problem. 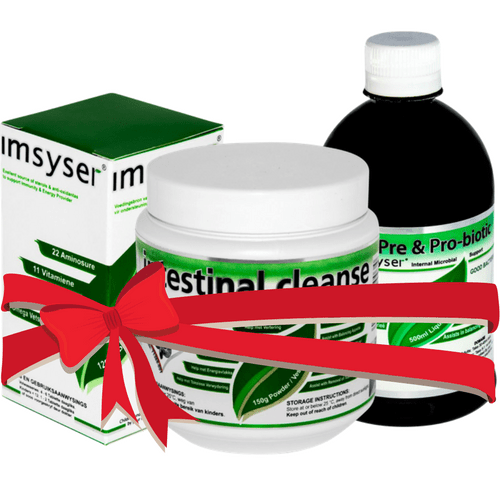 Imsyser 3 Step Health for optimal Health. It is a well-known scientific fact that for the body to function optimally i.e. free from disease a healthy Immune System (stemming from a healthy gut) is a fundamental requirement. All our health products originate from this view point, supporting optimal balanced Immune Health through a healthy gut functioning, and are intended to form a well-balanced, stabilized body condition.